Although we stayed at Shangri-la Hotel during our trip to Chiang Mai, we decided to check out the famous Dhara Dhevi to see what all the fuss was about. Dhara Dhevi is Chiang Mai’s most luxurious hotel. 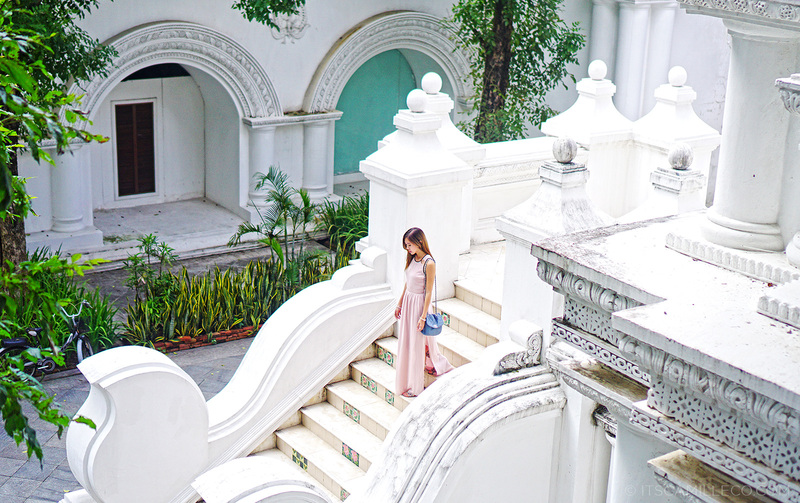 With 60 acres of beautifully landscaped tropical grounds and modeled after the ancient Lanna city, it greets you as if it knows its the king of all hotels. I couldn’t believe my eyes when I stepped out of the car and into its doorstep. I felt like I was entering a palace! Don’t get me wrong, I’ve seen plenty of luxury hotels. But this one is on a league of its own. It’s not only extravagant but full of character as well. You can really see ancient Thai architecture at its finest. I wasn’t actually supposed to take outfit shots here, thinking we were only going to grab brunch. But with a view like this, it would be crime not to make the most of our short visit. Don’t you think? You fit perfectly in Dhara Dhevi. It is as if you own the place like you’re the queen of the Palace, more like the Goddess! And without reading this post, I thought this is another temple. Lol! I can really feel the emphasis there while you were explaining that Dhara Dhevi is beyond it’s league. Photos say it all, what more if I saw it in person? It would totally be majestic for sure! OMG!!!!! Goddess! Then i died..
Love your dress!!!! The place is totally grandeur! How I hope you had photos from the inside of those temples. :3 Hihi. you look like a Greek goddess with your outfit!! That’s what you wore for brunch?!! Hindi pa yan pang outfit shot?? Ikaw na talaga Camille ang fashyown everywhere. Love the place!! :) Oo nga, sayang ang view. Kasalanan not to take outfit shots there. Wow!Hotel looks amazing. you’re right it looks like a palace and you belong there, you look like a Goddess miss Cams. <3 Details of the sandals is amazing and greatly combined with your skin tone. :)) Take care and Godbless! ang bongga grabee!! O.O bagay ka po sa ganyang places coz you’re also classy and elegant. and the back detail of your dress is super super like! :) yey! anyways, are you going to spend the holidays here in the ph? hihi.. thanks!God bless you po..
how tall are you? And…what’s your workouts like? 5’7″. I usually just train with PT so up to her! Free weights, TRX. Not much cardio! Perfect outfit choice for this lovely place! Oh thank goodness you decided to take outfit shots here Cams. Seriously though, this is a hotel? It can pass as a tourist spot on its own. It is by all means grand. Yeah! I thought so too! Chiang Mai looks amazing and so do you. I love your dress and your sandals. It’s so glam gladiator. It doesn’t look like a hotel! Hahaha! More like a tourist spot or maybe because you didn’t include here the pictures of Dhara Dhevi? Oh I really want to see what’s inside :)) Just wondering, did you bought your dress here in Manila? I really love your gladiator! Thanks Kay! I think I bought it abroad. Even the inside looks like a tourist spot!